Wisconsin: What's Behind the Most Brilliant Lights in the Sky? Space physicists at University of Wisconsin–Madison have just released unprecedented detail on a bizarre phenomenon that powers the northern lights, solar flares and coronal mass ejections (the biggest explosions in our solar system). The data on so-called “magnetic reconnection” came from a quartet of new spacecraft that measure radiation and magnetic fields in high Earth orbit. “We’re looking at the best picture yet of magnetic reconnection in space,” says Jan Egedal, a professor of physics and senior author of a study in Physical Review Letters. Magnetic reconnection is difficult to describe, but it can be loosely defined as the merger of magnetic fields that releases an astonishing amount of energy. 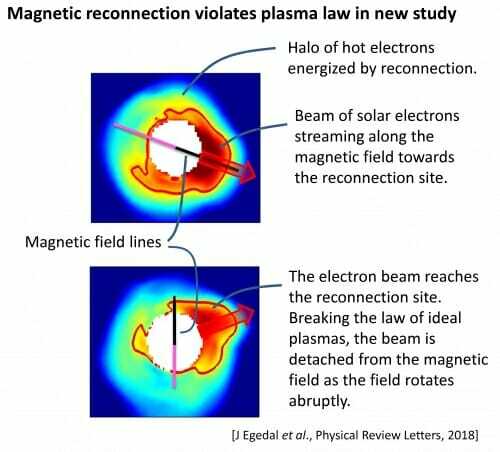 Magnetic reconnection remains mysterious, especially since it “breaks the standard law” governing charged particles, or plasma, Egedal says.